Oftentimes, while traveling, we have met people who are doing extraordinary things. Some are traveling by motorbike only, some travel and volunteer extensively, many have relocated permanently and others have been on the road for much longer than ourselves. But the Cave Lodge, and it’s story, struck me as truly being extraordinary. 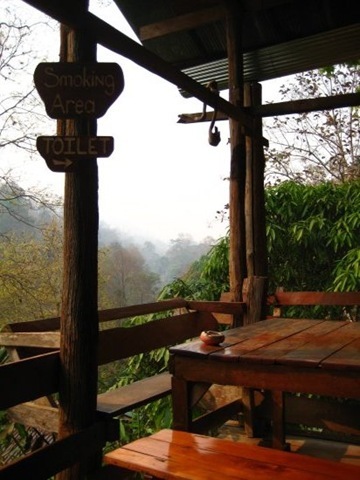 We heard about the Cave Lodge while sitting on the patio of our guesthouse in Mae Hong Son. A German fellow traveling with his family said they had just come from there and that it was simply magical. Up in the hills, nestled on the border of Thailand and Myanmar, he told us of hikes through the woods and days spent exploring local caves. We immediately changed our plans and headed there the next day. The Cave Lodge is rustic and beautiful, set on a ridge overlooking the river right next to a Shan village and Tham Lod, one of the largest known caves in Thailand, but it is the story of the man who built it that makes the place magical. There are plenty of people who have visited Thailand and never left, many have come and set themselves up on a beach to stare endlessly at the sunsets, some even fall in love and marry but not many help shape the history of an area and become entrenched in the culture the way John Spies has done. He was one of the pioneers of the northern Thailand trekking industry, but not before he had met and married his Thai wife and had spent many a year in remote villages living and breathing the ebb and flow of life on the Thai/Myanmar border during the time of rebel activity and opium trading. He is credited with discovering and naming dozens of caves in the area and has helped scientists and spelunkers alike explore them over the years. He, and his friends, built the lodge by hand in the early eighties. It is a big, open concept building built of teak wood and bamboo with a kitchen at the back, a fire pit in the center and surrounded by bungalows. 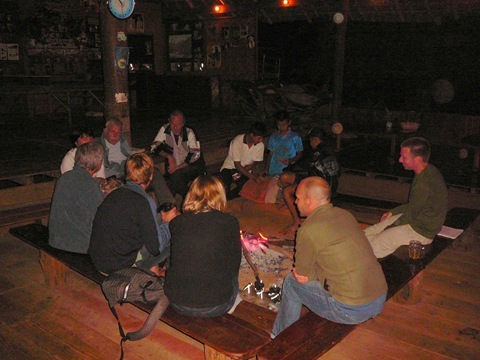 We spent our days hiking and caving and relaxing, and our evenings around the fire pit chatting with other travelers. While there we heard stories of the early days when travelers would get off the bus in Sappong 10KM away and would hike into the lodge. Of huge parties, where the bamboo floor boards would snap from the strain and, at the end of the night, the floor being filled with tired partiers who would simply pull out their sleeping bags and crash. Traveling then would have been so much different than now…no mobile phones, no internet, no guidebooks…it really was the new frontier. It was easy to imagine that time as we sat in the lodge. The Cave Lodge exuded its history. During this trip I have visited countless ruins and lost cities but nothing captured my imagination like being here. I wandered around it imagining what it must have been like to be here in those early days, to be one of the first travelers to an area, to commit to a lifestyle like that, and to still be living it all these years later. I think it was meeting the people of the stories that made the difference. It wasn’t just an old building with a story, but it was a story told by the building and the people in it. It really was magical. This place sounds sweet! I think if I ever managed to find a working time machine I’d definitely head to thailand before the masses got there. Just to be one of those who said they were there before it was the Thailand we see today. I have a bad habit of looking at my generation as crap compared to generations of yesteryear. Ah well, gotta work with what you’ve got. Cool post guys! Another place you’ve written about I would love to see! sound absolutely magical…how wonderful for you to have experienced that!!! Pingback: Golden travel tips from travel blogs | . : dream a little dream : . Reading this reminded me a bit of watching the movie “The Beach”… Finding that lost, old place free of outside interference, like the Cave Lodge seemed to be (more) in those early days. I would love to see it in person :-) Thanks for sharing!